Irreverent crazy lady, murderess and mixer of viagara and rohypnol cocktails! 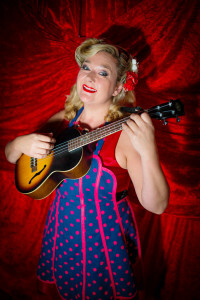 Bunny has performed in 3 award nominated shows in Perth Fringe (Aus), Machchynlleth Festival, hosted at Edinburgh Fringe, appeared with Club Briefs sell out show (Aus), Marcel Luconte’s Cabaret Fantastique (Aus), Mary Bijou Cabaret, Komedia, The Social Club, Bestival, Glastonbury Festival, Cabaret of Curiosities and other choice shows. Lovable psycho housewife Bunny is a domestic goddess with a difference. Imagine meeting Nigella Lawson, Lorena Bobbitt and Myra Hindley all rolled into one around the kitchen table for a G & T and good old sing-along. Singing a song both cheery and dark in equal proportions about lost love and the demise of her ex boyfriends. She loves a drink, cleaning and making her “special” recipe meat pies but for some reason she can’t seem to hold a good man down. Help her on her quest to find true love and a lasting relationship, on the way you will find out some things about Bunny you may wish you hadn’t! 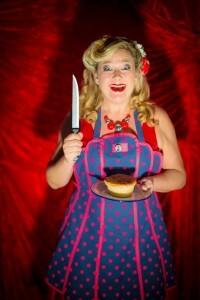 She will give you meat pie, sing you a song and if you’re lucky you’ll duck her flying knives. This is a warning for all you internet daters out there. Bunny is the top female knife thrower performing on the cabaret circuit in the UK and the UK’s first knife thrower. Spanning the gap between circus, cabaret and comedy and she equally happy in all of those genres. She has made appearances in stand up shows with top international comedians including: Bryan O’Gorman (Canada), Jacques Barrett and Chris Franklin (Aus), Marcus Birdman (UK), Alexis Dubus (UK), Chico Will (USA). From the moment she takes the floor, her adorable beam belies the awful comedic truth… Bernice, the Bunny Boiler is one damaged and deranged dame. With poise, verve, and a dash of hot sauce, Bunny takes us on her ill-fated journey of love and loss. The loss of her men. Well, the untimely loss of their lives. Bunny Bunny Bunny! You fed the audience meat pie and flirted with them as you did it! You are Mrs Lovett AND Sweeny Todd rolled into the dough of a Cabaret performer. Never again will I read an internet dating profile in the same light. “Adores cooking” yikes! Full length show Bunny’s Killer Comedy also available. Fun Fact: After a few close calls, she also has a license to import dangerous weapons to Australia!